Accomplished much in February .... and will have a plan for March .... to one bit at a time!! too much ............but going to change all that! Lightening the load from one room to another ... feels good! OOPS haven't posted in a few days......but I'm maintaining. Just finished laundry and it is all put away. Copied 5 books on CD from the library onto my iTunes. I copy them onto thumb drives and play them in the car. Grocery shopping is done and all put away. Lean Cuisines were on sale $1.49 - so I stocked up. I always add a bunch of veggies to them to make a decent size/filling meal. we had really bad weather today. many of the schools were closed. i brought my work laptop home the night before. afer setting up my work space i realized how dusty and cluttered my desk was. so after my scheduled shift i dusted my desk and trough out some unneeded things. i also think i fixed an issue i was having with my monitor. the problem seems to be gone. Today I finish cleaning out my huge executive desk. Out of the house the desk goes. Most of the critical paperwork has been scanned into Evernote then shredded, spare office supplies donated to a local school. I feel like I have a fabric addiction !!! I'm cleaning through my fabric stash. did my annual....."I'm totally stressed out, everything is out of control, I need to do a massive organization of the office" today. yep it seems like every tax season I end up doing that at some point. Went thru all the drawers and baskets in my master bath vanity. I threw out tons of stuff that wasn't used or had expired. Then put like items in small containers or plastic zip-loc bags and took all the baskets (where I store lots of stuff ) hosed them off in the yard and when they are dry and put back in place.... all will be cleaned. Last thing I need to do is wipe down all the counters and it sure looks nice and organized. I cleaned out the walk in pantry from top to bottom! discovered FOUR boxes of cookie cutters! Saved my favorites (one box of ones from my mom and grandma) and daughter will pick through the 3 other boxes, then I will send off the remaining to a family in Gatlinburg who I have been sending a few things to each month after the November fires. No one can make that many cookies! Oh and the breadmaker went to Goodwill! Hi all - I've made a mess of my house today. My Quilt Guild asked me to sew binding on the edge of a Charity Quilt (beautiful quilt!!) But it is a MESS. I have tried to sew the edges in prep for the binding and it is all puckered, threads all over my house from ripping it out, bits of fabric and thread all over. I am so ticked off at this darned binding and the mess it is. But, my bed is made and I did pick up some twigs, leaves, and debris from our horrible rain storm last night. I have the dishwasher running and need to do a load of laundry. I've been slacking with the horizontal surfaces again. My office is clean, and now I'm working on my kitchen refrigerator. Still struggling to find balance. 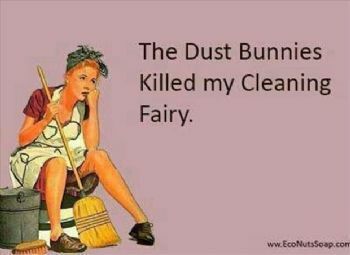 i can do most of my cleaning but i still dont get it all done. i am not sure if i am lazy, lethargic, unfocused or a combination of them. however no giving up. i will do a little bit at a time. today I am searching for balance in my life. I feel like I'm in one of those shows the the plates spinning on the poles and I'm trying to keep them all spinning and not falling off. You are all doing an amazing job of organizing and cleaning..... makes me feel like a slug !! I need to get busy. Yesterday, we finished up the last of the deep clean. My party was a success and it felt so good to welcome friends into a nice, neat, and organized space. Now I have to find a way to put all the stuff from the top of my desk armoire (that got thrown into a tote) back out in an orderly fashion so it's still accessible but neat. (kid's marker/crayon box, bin of office supplies, stapler, hole punch...) I must say, I am really liking it cleared off, but I don't have another area to store what I need. I'll find a solution. my youngest sister and ker hubby bought a new house and the precious owners were slobs. my mom and i focused on the basement. we washed walls , vaccummed the carpeted floors, washed mirrors, bathroom floor, put stuff in cabinets, put contact paper on shelves. Earlier in February, I finished our study ........(also exercise room) .... Now I enjoy easy maintenance ...... a wonderful reward that brightens my day every time I walk in. I'm having a Thirty-One party tomorrow, so it's major cleaning day for me. So far, I have the living room decluttered and dusted (I'll do floors tomorrow morning) and laundry done. I'm going to work on the family room and kitchen this afternoon after I go to the library and grocery store. Tomorrow will be dining room, bathroom and floors. Cannot believe it is already 1/3 of the way through February!!! So far, I have gone through all of my books (3 book cases worth, 2 of them with doors) and figured out what I can read digitally through our public library and what I can't. I prefer paper books, but rarely get the chance to pull one out and take it with me. So I only kept in my shelf the ones that are only available to me in the hard copy, and boxed up all the rest. I now only have one case of books left out (visible! ), and a list of my others in my bullet journal to check out and read digitally. First time in years I can see all of my books! Every moment is a new start. Completed the master bedroom ... Hauled a trunk full of good professional clothes to a thrift store yesterday!! Bedroom so clean and organized!! Packing my duds and heading to the Gym to start the day off on the right foot. Then planning a pedicure later on .... and a little pampering. Enjoying a good book read by a man whom I know wrote the book .... makes it all the more enjoyable! The office is emptied, and half painted! Today is prepare to paint the office day. My book shelves have been reorganized, and lots of once important items are on their way to a new home. Once the office is painted, only what we need will return to the room. -Time Saving Tip- .... for the day. I love keeping an organized home, and being able to find what I need quickly ... No searching for "where did I leave my keys" kind of thing. To FREE up valuable time for things I love .... I make time to clean up on the spot ... breakfast done or dinner ......... Get the table cleared and kitchen back to clean jiffy! ... I Don't put off. Actually, hubby took over my chore yesterday while I took my daughter out for a date and sewing class. Our bathtub had a rust ring for so long, we really didn't think anything would get it out. I went to a Norwex party at a friends house and got a cleaning paste. This stuff is amazing! Not only did it completely get the rust out, it shined up the whole tub and sinks too. It took some muscle and a bit of time, but it's clean! Thank you Hubby for doing it for me! Installed two shelves in my new oddice/craft room to be. Was able to put away two boxes full of binders on the shelves. Stellar day! So, yesterday I went through all of my shoes and packed up 2 milk boxes to donate. I left only what I actually wear! I also went to bed with all of my dishes clean and laundry done, except for a few things to fold today. Today on lunch I cleaned 2 cast iron skillets. Well, I picked up my new steam mop and I am impressed! My floors look so much better. It cut right through the buildup. I did the kitchen tile, hardwood in the main living areas, and the bathroom tile and it took no time at all. Just a little prep of picking up things from on the floor and vacuuming. Overall, from getting it out the box and putting it together, prepping the spaces, and mopping, I was done in under an hour. If I keep up the areas clutter free and just vacuum and mop it should only take about 30 minutes. Nice to get something accomplished. My kitchen only has enough cabinet space to put the non-perishables it it, so I have three 3 shelf bookcases along one wall. Instead of my usual just putting things kind of where they go and not looking at the messy shelves unless I have to, I reorganized them a bit and got everything into a nice orderly arrangement. I did this before breakfast and it felt great to cross something off my to do list (putting the groceries away) and getting something organized. "Processes" the mail and newspaper today instead of creating a hotspot. Made the bed. Really working on pick up as I go. Need a rest after shopping and seeing to Mom's needs. Then off to work on the room I'm decluttering 15 minutes at a time! I plan on continuing to build on the plans I made for January. I had some success, but not as much as I hoped since hubby was on vacation for about half the month and we just spent time together. I am picking up a new steam mop today - hoping it will work on my hardwood floors. The cleaner I have been using is leaving a streaky residue and I'm not happy with it. We paid too much to have our floors look dingy all the time. Even hand washing didn't do that great. I really hope to maintain the organization I did in January. I also have some kind of major plans for my kitchen for Feb. Need some cabinets repaired - so a good chance to purge and organize. Does Anyone Use OneNote to Organize Their Life? What I cleaned and organized in March 2019!